Coping Skills and Anna Ladd to keep us company. It’s already the end of October and I feel like this year has pinched me up and misplaced me on that sofa no one sits on anymore. It's almost as if 2015 has passed on by without me. I’ve been left behind and I’m getting dusty. I feel lost, pointless, and if I’m being honest – without the energy I need to pull myself up and dust myself off. I’m sure I’m not the only that feels this way around this time of year. We’re all just stuck in our own little holes inside our heads, waiting for something to fish us out. 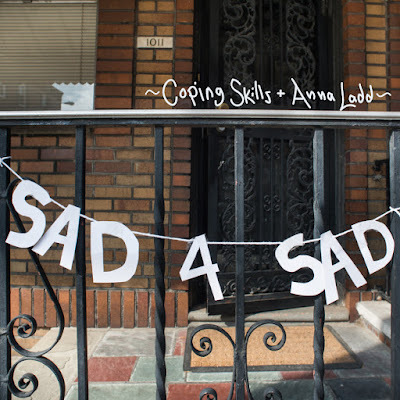 Luckily for us, this time Coping Skills and Anna Ladd have come along to lend a hand – they’ve come together, worked together, and produced something worth pulling your head up for: a split cassette tape, entitled SAD 4 SAD. This tape is only six tracks long – it only goes for about twelve minutes or so – and yet, this release manages to lay out every feeling I’ve had itching at my chest all year. In "Baptism on the BSL", Coping Skills frame my thoughts with a lightly brushed electric guitar, completed with a voice, fragile, and fluent in this feeling I was getting at earlier: “Spent my last few dollars on subway fare / so I could say I’m getting there / an eternity on the train floor / … / I’m not getting anywhere” . Images like these embody exactly how I’ve been feeling on the inside as of late, and I love hearing Coping Skills conjure it as they have in this song. In sequence with Coping Skills, Anna Ladd’s side of the tape moves in a similar way. Plucking out a riff with a steady beat, Anna’s songs feed into a lot of downhearted moments, yet keep up a nervous catchiness at the same time. Similarly to her spoken word poetry, Anna’s lyrics are eloquent in a feeling of self-doubt similar to a lot that’s going on in this hole in my head: “I have eyes, and I have teeth, and I have claws / I am defined by what I do with these parts / the sum of what I put between my jaws”. Needless to say, both Coping Skills and Anna Ladd have managed to hang a lot of my internal worries out to dry on the split. Listening to this cassette tape has made me feel like I’ve been doing an exchange: when I hand over my feelings, Coping Skills and Anna Ladd return them to me – sounding much better than when I had tried to lay them out on my own. It’s a process that’s allowed me to understand that, no matter how late it feels, it’s always best to pull yourself up from the dust and produce something out of all of those worries in your gut – because often, it comes up wonderfully. This cassette tape is my case in point. So from the bottom of my heart, thank you, Coping Skills and Anna Ladd, for allowing this exchange between us, and bringing me up from the dust. SAD 4 SAD means a lot. Listen to Coping Skills and Anna Lad on bandcamp.